Phone hanging refers to the state or condition when a mobile device stops responding to commands of it’s user. It is sometimes called phone crash and is characterized by screen freeze. In this article we will learn about the reasons behind phone hang and possible solutions. Most times, this can be frustrating as it delays user from performing other set activities on such mobile device. When such a problem occurs, just try the tips given below. Every mobile device comes with a designated amount of memory i.e RAM and a processing power. Hence, when such resource limits are exceeded, the device will surely hang. It is ideal to operate such device within its safety limits by minimizing the number of concurrently running apps. There are a number of apps that run in the background. It is a good practice to clear the RAM with apps solely designed for mobile phone optimization. The apps running on mobile devices like android devices can be seen through: here to see list of currently running apps, go to Settings > Apps > Running App. Mobile app developers keep on improving performance of their apps. When there is an update, a notification will be sent to your device for examle: Google Play (if you have Android phone) and iTunes App Store (if you’ve an iPhone). Therefore it is highly recommended that you regularly update all the apps as and when a better version is available. Whenever you visited a website you phone even computer automatically stores caches. a cache /ˈkæʃ/ KASH, (according to wikkipedia) is a hardware or software component that stores data so future requests for that data can be served faster; the data stored in a cache might be the result of an earlier computation, or the duplicate of data stored elsewhere. These unwanted data will be stored in your phone memory which leads to decreasing the available memory for apps and other files. You can solve this from setting. 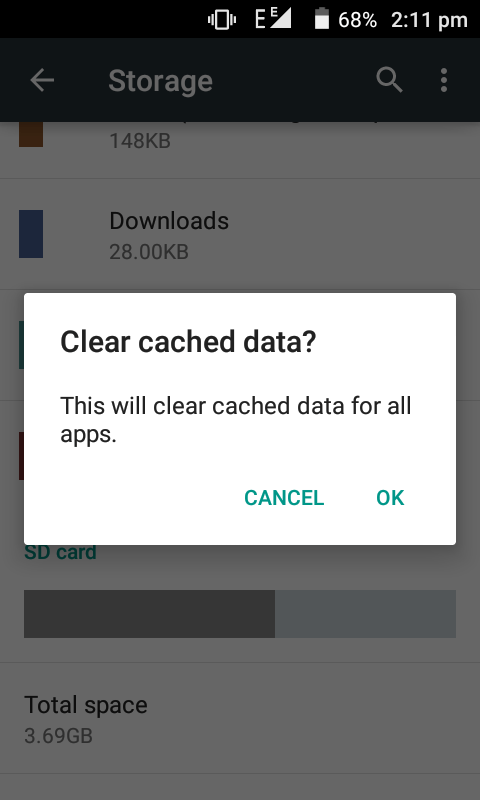 Go to setting>>Storage>>Click on the cache and click on the ok to clear caches. It has been known to be a good practice for phone users to move installed apps from internal to external memory. Once this is done, the phone will have much space on it’s internal staorage and as a result the phone will not hang. To do this, simply go to Settings > Apps. This particularly is what most ladies i know face. They can snap for the world, i just love women and their per second snapping but this has an effect if you are not using an external storage to savage your phone’s internal memory. Now If you have stored images, videos and songs in the internal memory; you’re really choking up the internal memory space and lead to your phone hanging all the time. When you notice your pictures,movies and other stuffs are choking up space, simply backup this data on your computer and then delete it from your phone. Photos, videos and audio take up most of the space the phone of an average smartphone user. And it is one of the common reasons why your phone hangs. You can get an SD card and move these files to it thereby making more room on the internal memory of your phone. This is a practice i recommend for any phone user. When you regularly use your phone , a lot of caches and other clogging of memory due to storage and continuous processing of apps underground and those you have engaged to work. This with time puts the phone on stress and then hanging problem will start. Most of the time lot of apps are not closed properly. Few apps are running in the background and consume lot of power due to which these devices will hang. To overcome this problem, you must have to turnoff or restart your phone. I personally do not recommend this method because it is not familiar with most of the Android users.This should be your last resort. If nothing else works and phone stills hangs, you can reset your mobile phone back to factory settings. Use of this option will remove everything from your mobile phone. Factory process may delete your personal data like contacts, memos so users must need to follow the secure process before performing the factory reset option. Whenever you perform factory reset process never forgot to take Backup of all your files.You can move this backup files to the external SD card. So as not to lose all the datas you have, once lost, cant be recovered except you backup such things you had before then.